At Ibiza Rocks Hotel, Monday, from 27 May to 24 Jun. Sparkling saxophone at the home of the pool party. Besides being island favourites, saxophonist Lovely Laura and DJ Ben Santiago have made a name for themselves internationally, too. It's easy to see why. Their high-powered sets, feel-good tunes and sunshine-fuelled soundtrack create their signature tropical island vibe, the perfect match for Ibiza Rocks Hotel. Lovely Laura has become an internet sensation. Having performed globally, the professionally trained musician has played at Ministry of Sound, Pacha Ibiza, Ushuaïa, O Beach Ibiza, Mambo Ibiza, Es Paradis, Tomorrowland, Amnesia and many more. Likewise, the highly skilled Ben Santiago has held many enviable residencies. Among them, he has played for the world's biggest brands, such as Amnesia, Cream, Café Mambo, Café del Mar, Glitterbox, Hï Ibiza, Pacha, Pikes and Space, to name a few. 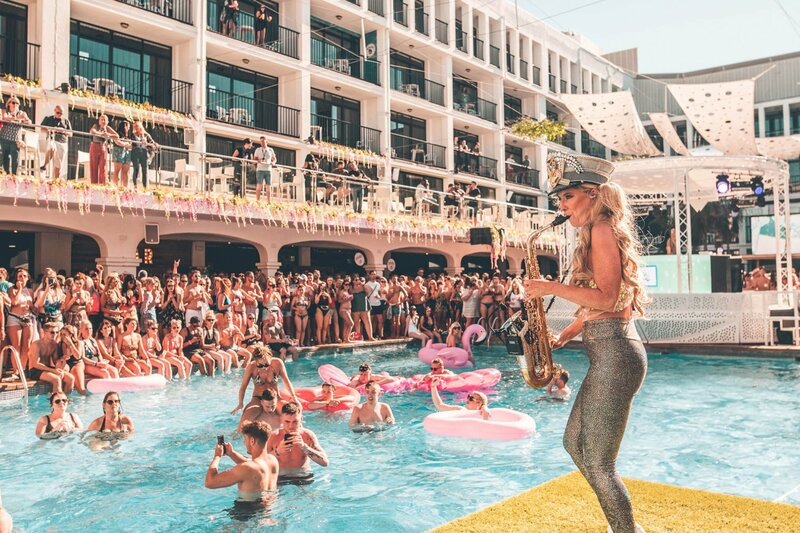 Their infectious sound, filled with energy and groove, create the ultimate pool party at Ibiza Rocks Hotel, widely recognised as the home of the pool party. You can catch them on five Mondays this summer, from 27 May to 24 June 2019 at the popular San Antonio daytime venue. For confirmed details and tickets, see our calendar below updated daily.